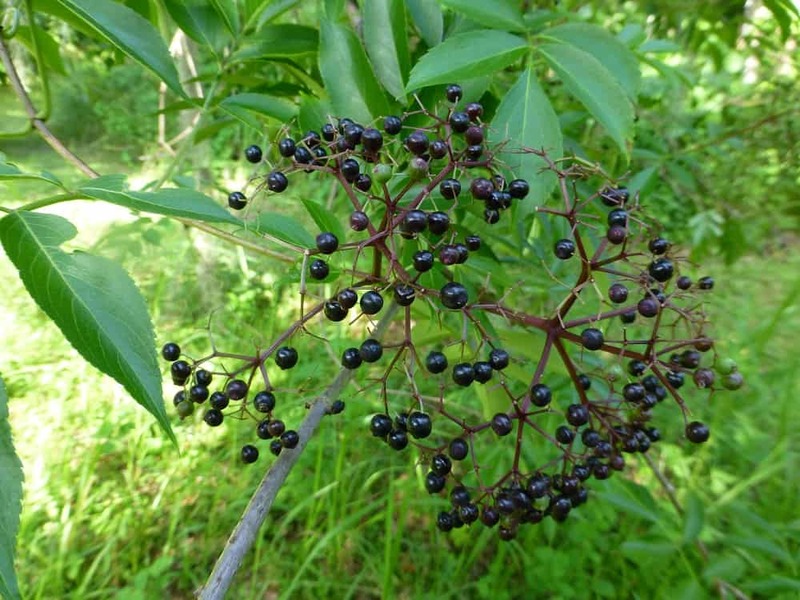 Elderberry (Sambucus nigra ssp. canadensis) is a large shrub in the Adoxaceae family. 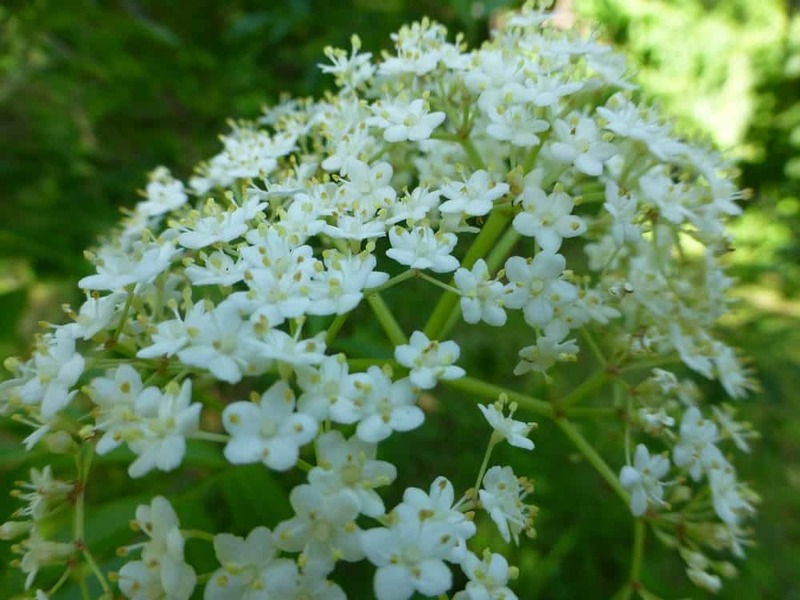 Other common names include elder tree, sweet elder, and wild elder. It is clonal forming and produces dense thickets when it is in its preferred habitat. It usually reaches a height, and stature, of a small tree even though it is generally referred to as a shrub. 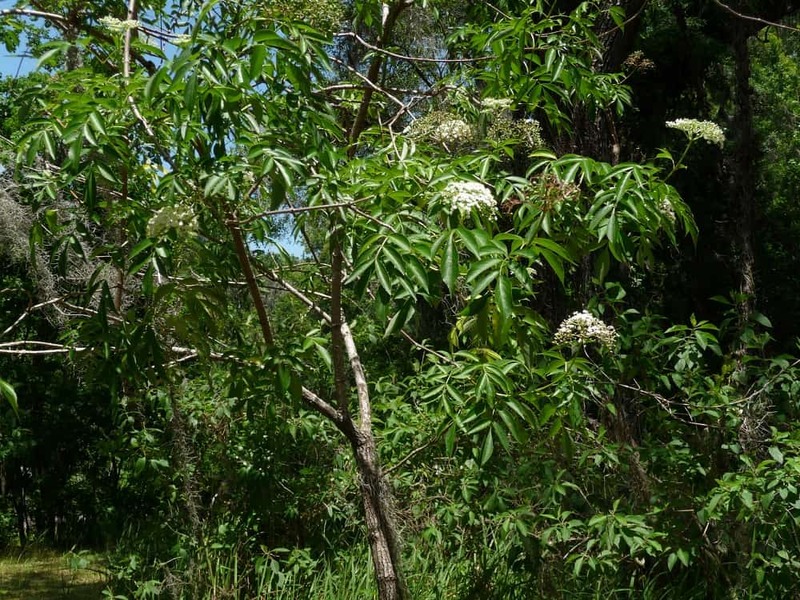 Elderberry grows quickly and can reach fifteen feet within a couple of years. Although the heartwood is very dense and strong the branches are weak and tend to be arching, especially when heavy with fruit. Its preferred habitat is wet hammocks, shallow ponds, along streams, margins of swamps & disturbed sites. It can be grown in the home landscape with a little extra watering, or maybe not. Friend and fellow native gardener Don Robinson grows his elderberry in the sandhills of Spring Hill and has it attaining almost champion size. So, don’t be afraid to try it in locations other than its preferred, wet, habitat. Its leaves are opposite and pinnately compound. The leaflets are toothed and found in numbers of 5-9. The lower leaves may be trifoliate.The small white flowers are born in flat topped clusters, and bloom all year, however, their peak blooming time seems to be summer. The flowers can be used in pancake and fritter recipes once the stems have been removed. The small black berries hang in clusters, and are eaten by birds and mammals. They are eaten by humans as well, and are used for making pies, jellies, jams, and wines. They can also be used as a substitute for raisins in bread pudding recipes. The unripe berries, bark, root, and leaves can cause nausea, vomiting, and diarrhea and should not be ingested. The fruit and flowers should be cooked first if they are going to be consumed in large quantities. The berries are rich in Vitamin C, and also contain Vitamin A, calcium, iron, and potassium.